Few couples in comic book history come close to the stature of Mary Jane Watson and Peter Parker. Even though they haven’t actually been a couple in the comics for over a decade – something that could be about to change – Pete and MJ’s relationship has been one of the most dramatic and beloved in comics. Given that their complicated history might be about to resume once more, here’s a brief rundown of their shared past. Although Peter Parker had several love interests in his early comic book history – most notably, of course, Gwen Stacy – when Mary Jane Watson was introduced, she was clearly the be-all and end-all of Spidey relationships. Before that, early issues of Amazing Spider-Man spent almost a year teasing her as a potential romantic partner for Peter, with Aunt May constantly trying to set up a date between Peter and the mysterious, unseen Ms. Watson. 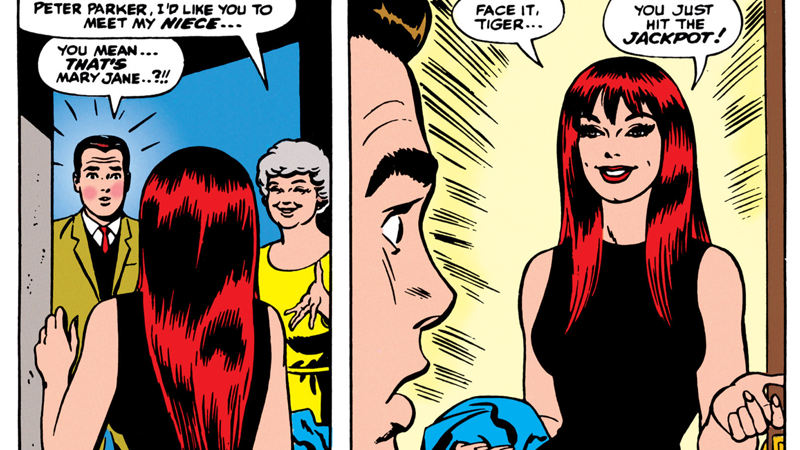 Peter wouldn’t first meet MJ until the final moments of Amazing Spider-Man #42 – with the cry of her famous line, “Face it, tiger... you just hit the jackpot!” – and it was love at first sight. Peter immediately began dating her, but it didn’t last that long, and the couple eventually broke up for the first of many times. This led to Peter dating Gwen again while MJ, still a good friend to the duo, hooked up with Harry Osborn. Gwen’s now-iconic death at the hands of the Green Goblin in Amazing Spider-Man #121 drove Peter and Mary Jane together again as they both tried to come to terms with the loss of Gwen. But once more, it didn’t last that long – Peter’s dual life as Spidey began to tear them apart, and when Peter offered a hasty marriage proposal, Mary Jane turned him down, and decided to escape her stressful life with a move away from New York, leaving Peter on his own again. Upon her return (and the reveal that she had figured out that Peter is Spider-Man), the two remained friends. But dual traumas – Peter losing his close friend Ned Leeds, and Mary Jane confronting her crooked father – led to the two getting closer again, and this time Peter’s second marriage proposal stuck. Well, actually, MJ turned him down again but eventually reconsidered. 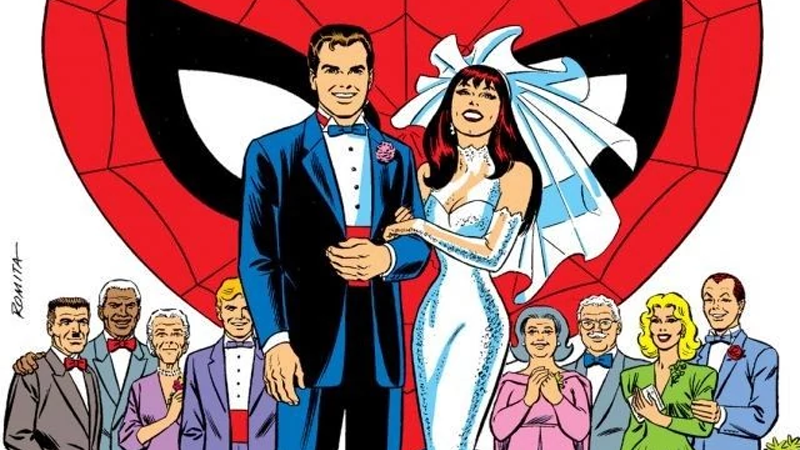 Peter and Mary Jane got married in 1987's The Amazing Spider-Man Annual #21, a full 21 years after the two first met all the way back in Amazing Spider-Man #42. Which means, they lived happily ever after until a certain incredibly controversial event that we’ll get to later undid all this, right? Peter and MJ’s married life was defined by a frankly absurd amount of drama. Mary Jane’s modelling career hit new highs after her marriage, only for her to be stalked by her former landlord, who not only ruined her career but then kidnapped her (the first of many, many kidnappings during her marriage). Meanwhile, Peter was distraught by the arrival of a couple claiming to be his long-thought-dead parents. Once they were revealed to be Life Model Decoy robots sent by the Chameleon (hired by Harry Osborn in an attempt to get revenge for the death of his father Norman, a.k.a. the Green Goblin) to kill him, Peter had a total mental breakdown, abandoning Mary Jane for a while before they eventually reunited. And then, oh and then, there’s the Clone Saga, one of the most infamous Spider-Man stories ever told. In between all the wild nonsense about Peter clones, Ben Reilly, and Peter being convinced that he’s a clone so he abandons being Spider-Man altogether, Mary Jane became pregnant, only to tragically give birth to a stillborn child after she was poisoned by an agent of the Green Goblin. The horror and stress of the whole event – which culminated in the return of Norman Osborn, the apparent death of Ben Reilly (don’t worry, he got better too, eventually, sort of), and Peter’s return to the Spider-Mantle – understandably put the couple’s relationship on the rocks. Then MJ got kidnapped (again) by a telepathic mutant who wanted to steal Peter’s life (and his wife) and staged a plane explosion in Amazing Spider-Man #13, which led to Peter believing MJ was dead for over a year. When the couple reunited, the additional trauma of her months-long captivity led to Mary Jane spending time apart from Peter while she recovered. As if all this wasn’t more than enough kicks while Peter and MJ were down, Civil War broke out in the Marvel universe in 2006, which saw Peter’s identity made public, the superhero community tearing itself apart over something that is in equal parts tragic and dumb, and Aunt May and MJ having to go on the run after Spider-Man’s ginormous roster of foes started chasing them in the wake of Peter’s big, foolish reveal. It’s this moment that led to Aunt May taking an assassin’s bullet intended for Peter, putting her in a critical condition – and the arrival yet another of Spider-Man’s most infamously reviled storylines: the immensely unpopular One More Day. 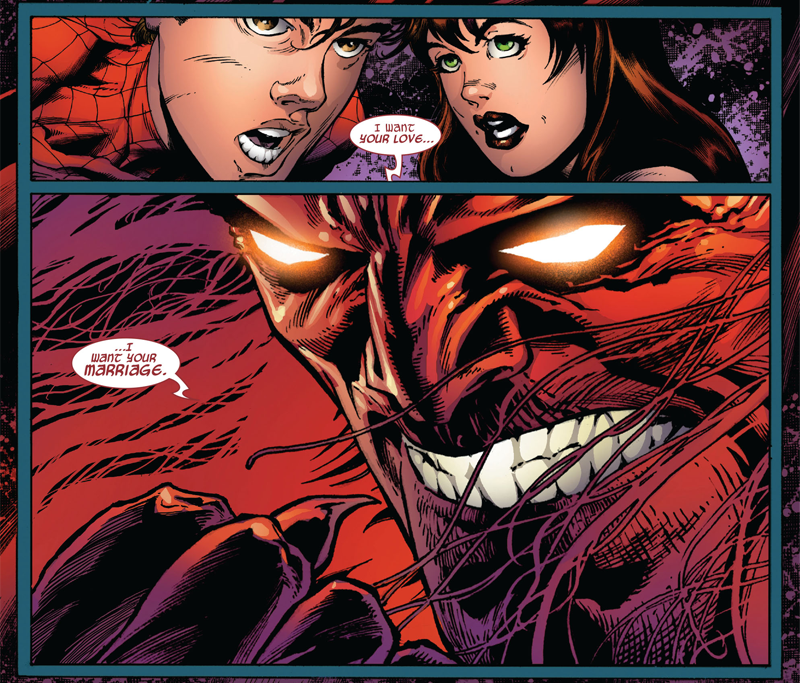 Mephisto, basically Marvel’s answer to Satan, offered Peter and MJ a chance to save May in exchange for wiping their marriage from existence, allowing Mephisto to feed off of the endless tragedy of a happy life left unlived. Peter and MJ agreed (it’s eventually revealed MJ bartered with Mephisto so he’d never meddle with Peter’s life again if the deal went through), and Mephisto altered history. In this new reality, Peter Parker and Mary Jane Watson seriously dated for multiple years and then broke up, and Aunt May recovered from the assassination attempt on Peter’s life. Twenty years after they were first happily married, Peter and MJ were no longer husband and wife, to the abject fury of fans and critics alike. That still left the problem of Peter’s identity being made public during Civil War, however. Peter asked Doctor Strange to cast a spell that would wipe his identity from the mind of everyone in the world, including Mary Jane, in Amazing Spider-Man #641 – only for Peter to protect Mary Jane from the spell’s effects at the last minute. Despite being kept in on his greatest secret, Mary Jane ultimately decided she couldn’t keep risking the danger of being someone special to Spider-Man, and told Peter to move on and find someone else to share his life with. 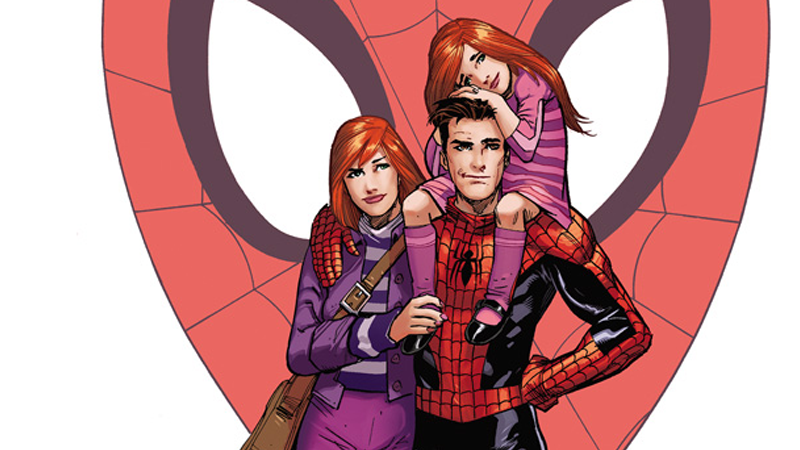 The revitalisation of Marvel’s continuity in the wake of 2015's Secret Wars kept this status quo for MJ and Peter – although fans jonesing for the couple’s time together were thrown a bone by Marvel in the form of Spider-Man: Renew Your Vows, an ongoing series that began in 2016 about an alternate-reality version of Peter and MJ that remained married, had a daughter together, and currently fight crime as an entire Spider-family. In the “All-New, All-Different” Marvel era, Peter became a highly successful and rich tech CEO with his own company, while Mary Jane began working for Tony Stark after her attempts to operate her own chain of nightclubs ended in superhero-battle-induced rubble. While the two were still friends – despite Peter’s discomfort at seeing MJ and Tony working together – the duo spent the last few years relatively distant to each other, as they both continued to try moving on. 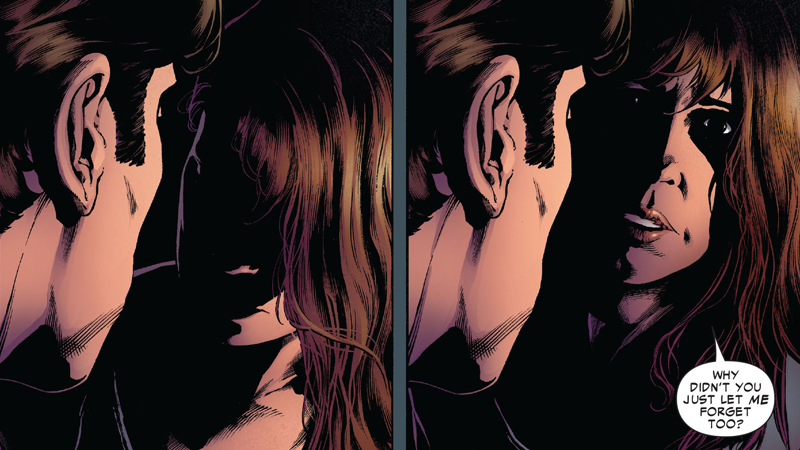 That is, until Marvel’s latest relaunch in Amazing Spider-Man #1 earlier this month, by new creative team Nick Spencer and Ryan Ottley, which concluded with Peter and MJ embracing each other and seemingly rekindling their romantic relationship. Obviously, this reunion is not necessarily a guarantee that the marriage once undone by One More Day will eventually be restored. But who knows? It wouldn’t be the craziest thing that’s happened to Peter and Mary Jane in their 50-plus year together.